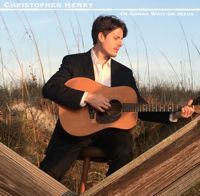 Chris Henry: I'm Gonna Wait On Jesus DVD - This DVD accompanies the "I'm Gonna Wait On Jesus" CD with full length videos of Christopher playing and singing all of the songs. Watch split screen action of Chris playing and singing all the parts on many of these songs. Full band videos for the title track “I’m Gonna Wait on Jesus”, and “Miss Missin’ You”. This DVD features a bonus song and video, “Brand New Pair of Blues”.